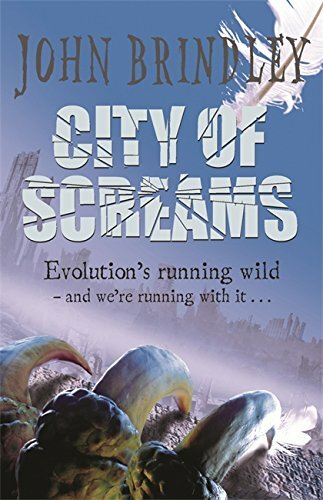 Genetic change, growth and evolution form a backbone in City of Screams, the follow-up to Brindley’s The Rule of Claw. Evolution has led to a disparity on ASP Island between land bound Aigles such as Phoenix and those with free flight through the skies – like the air Aigle Gabriel. This forms an ever-present tension throughout the book and one whose impact is significantly elevated upon the arrival of Adults on ASP, an eventuality that signals a shift in narrative direction. As scientific truth and spiritual belief diverge, a peculiar and intolerant hybridised fundamentalism is born out of the denial of evidence surrounding the Adults and their unquestioning devotion to past world views. The resultant effects systematically threaten the component parts of the balanced ecosystem that has developed upon the island. Mirroring its construction of evolution throughout the novel, the gait of the book is considerably accelerated making this something of a speedy read. Long after the tale is told, its aftertaste remains as hanging questions are left as to the nature of physical change and development if our individual world-views and systems of belief are ossified.